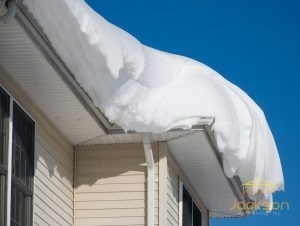 Prevent Winter Damage to Your Roof - Jackson Contracting Inc.
Winter can sometimes be picturesque and fun. However, it comes with some risks. As pretty as snow on the roof may be, it can also be a real problem. Prevent winter damage to your roof by address snow, ice, leaves, and other things that land on your roof when it’s cold. Prevent Winter Damage to Your Roof. When your attic is too warm, the ice and snow melt and drain down. Unfortunately, when it reaches the edge of the roof, it can create an ice dam. If your roof is ventilated, it may be cool enough to prevent this excess melting and re-freezing. This plus good attic floor insulation can help keep the warm air in your home. When snow and ice on your roof melt, they drip into your gutters. If they freeze again in the gutters, you have a heavy mess of ice and leaves. Water won’t be able to flow away and the gutters will be hard to clean. They could weigh down the edge of your roof and cause significant damage. Snow, ice, and everything gathering on your roof gets heavy. While your roof is meant to protect you, that doesn’t mean that all the weight won’t cause damage to your roof just by sitting there. Remove as much as you can with a snow rake. Be careful when you do this; falling snow and ice can injure people and items below the roof. At Jackson Contracting, Inc., we work to make sure you have the strongest possible roof for all seasons. Prevent winter damage to your roof and call us at 317-214-8124 for a professional roofer.